"Lycan" is a virtual reality project experimenting human transforming experience. Interactors interact with dramatic agency in the medieval mystery and immerse themselves with the story arc. 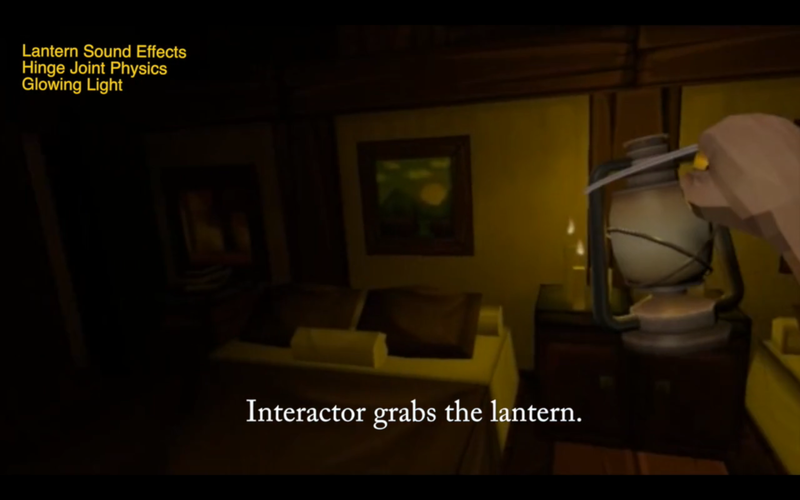 The highlight goes to the interaction design in werewolf transformation, including visual, audio and haptic changes. As a first VR interactive-narrative project in Experimental Television Project Studio, our main purpose was to explore VR as an interactive storytelling medium. There is still a lack of design convention for VR, especially on the topic of how to design interactions that will drive immersion and create more presence of users in the virtual world. We face the challenge of what story to tell, what experience to create, and what interactions to design, with thought-through design ideas, in order to create the immersive interactive narrative in VR. VR is a new digital medium for interaction design and storytelling for me and my team. Under careful guidance from our project advisor Dr. Janet Murray in the 4-month project studio, I was able to step inside the door of VR and gain a hands-on design experience with it. We started from researching the history and development of VR through lots of paper and industrial projects to explore its nature and capabilities, to designing a carefully thought-through interactive narrative and programing the interaction using HTC Vive and Samsung Gear VR. Along with the concrete theory and practice, we were given the opportunities to connect with several VR designers and researchers, bringing us closer to the real VR industry by their first hand sharing. Thanks to their time and insightful conversation! Through constant absorbance of knowledge from ongoing research, projects and experiments, I have build myself an attitude toward VR interactive narrative design — As VR designers, we created dramatic agency in each plot of narrative with immersive environment to encourage users interaction, which becomes the trigger to proceed the narrative forward and further reinforces immersion. These concepts are crucial as we created our narrative and designed the interaction as well as environment, for that we know in each plot what focus (point of interest) we need to put our design efforts on, how we can test with users and which part of details to improve on (e.g. audio, lighting, timer), and most important of all, how we can ensure to design a successful interactive experience in VR environment. Along with the newest VR related articles, invention and design, the following list of articles and VR experiences greatly help me build a thoughtful concept toward VR experience design. We started our narrative script from a concept of room-scale VR. We didn't want to resolve the uneasiness of teleportation but want to more focus on the story and interaction within a fixed area. With that in mind, we then decided to add mystery and tension to our narrative, for that we could have more elements and freedom to design for a mysterious setting than to mimic a more real environment. 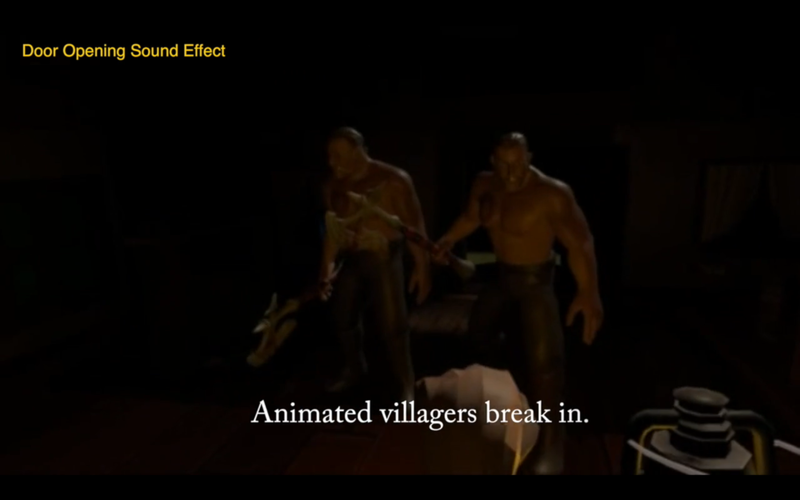 Thus, we presented our story of a suspense werewolf transforming experience, where the interactor in the beginning thought he was to protect himself and defeat the werewolf, but in the end found himself transforming into a werewolf and was surrounded by villagers. To create an interactive narrative experience in VR, it is not enough to just have a nice story. Under each plot, we need to direct interactors' attention to a point of interest (POI), and provide a dramatic agency where main interaction and drama occur. This is the part we discussed back and forth for months, for that we want to make sure the dramatic agency itself fits in each plot and catches interactors' attention, the transition of plots are immersive, and each interaction differentiates from others but also are intuitive enough to engage interactors. In the end, we had defined the dramatic agency for each plot, with indication of story and interaction accordingly. Unlike design for traditional digital media like app or website, the prototyping of VR requires full developing skills. To realize the concepts we design under each scene, for example, in scene 1, besides the interaction of picking up a lantern, we need to build a mysterious room with corresponding audio and lighting to immerse interactors and fool them as if they are really in the medieval age. Throughout the whole semester, we had managed to implement scene 1 and 5 as a prototype of our concepts— introducing interactors to a story and presenting identity transforming experience, and test with our demo attendees. With my former experience in Unity3D, I took the lead of implementation to integrate design from each team roles- audio, lighting, interaction, animation and 3D model. Even with a little developing experience before, designing and prototyping for VR is still a challenge for my team and other teams in our studio. Issues like the different expectation of a prototyping showcase, level of dedication and capability from each individual, extra time and efforts required to combine different individual works, room for improvement after user testing and advisor's feedback, and difficulty of expressing VR ideas through words... were confronted and struggled by my team. We had much discussion and negotiation within our time and resources constraints, where we finally managed to bring individual capability together and identify a clear statement of our design goal — experimenting the design of identity transforming experience in VR — which we hope to bring forward as a design reference for identity transformation in general. As for my first VR experience design project, I am glad not only to learn to develop with primary VR technology, but really went through all the conflict and chaos of the design process and brought a successful deliverable outcome. It was thinking through all the concrete theory and practical experiences from VR experts and researchers that guides me through the confusion. Questions like "What exactly are we designing for? A story with interactive plots, a game in VR, an immersive environment with audio, visual and haptic effects, or others?" was constantly thought-through in my head — we create contents specifically designed for VR as a new medium, utilizing its technology affordance through design, and create a unique VR experience that can enrich human experiences. For my next step, I would love to keep exploring the creation of interactive narrative content to further bring immersion and presence for interactors in VR.